Create an incision at the top of the cutlet, near where the bone meets the flesh, create a pocket for the stuffing. In a bowl fold together the sundried tomatoes, olives, Italian herbs, 1 teaspoon olive oil and season with salt and pepper. Add the feta and gently combine, creating a paste with lumps of feta. Lightly drizzle the cutlets with olive oil and season with salt and pepper. 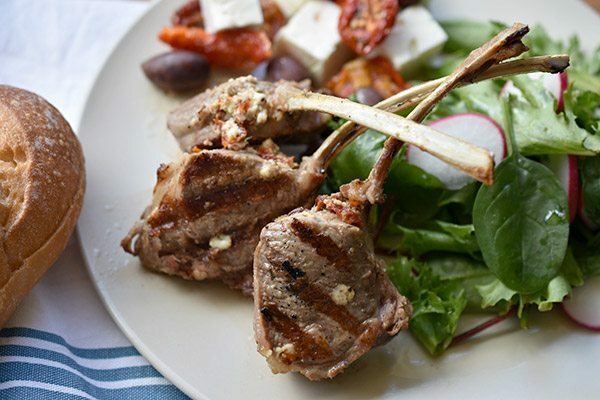 Once the barbecue has preheated, barbecue the lamb cutlets over high heat for two to three minutes per side.